Had this wine in my cellar since 2008 when I bought two bottles. First bottle was served almost two years ago, but did not take any notes. This second bottle was served very chilled – I actually forgot it in the freezer for about one hour. The wine warmed gradually in the glass during a pleasantly sunny SAT afternoon with 29 Celsius outside. 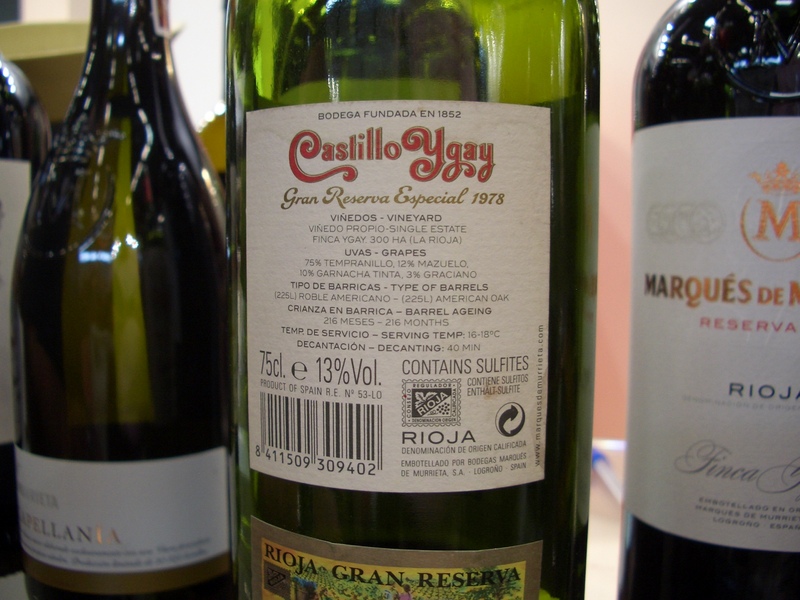 While there is not a pronounced complexity, the wine drinks well right now and compliments food very well. Had it with shrimps saganaki and Greek style pasta with shrimps and tomato sauce. 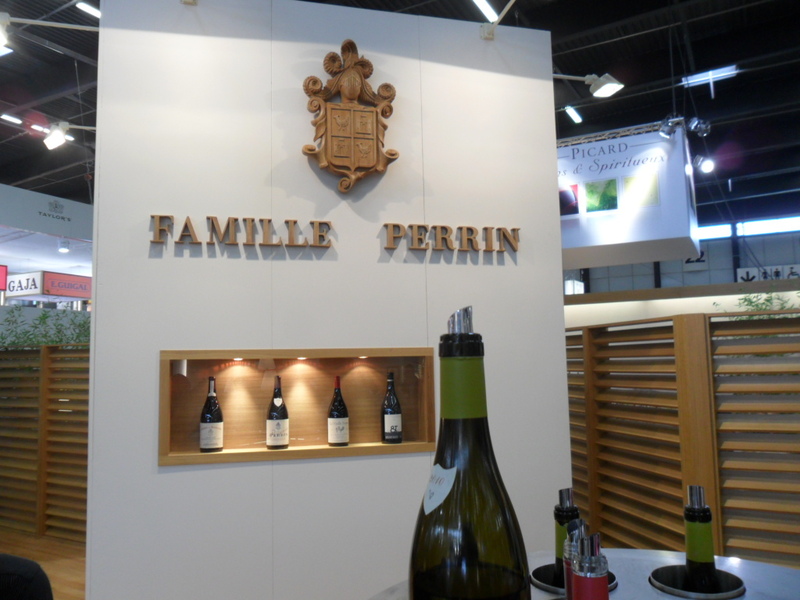 Another producer visited this June at Vinexpo 2011 that impressed me with its wines, was the Perrin’s booth with its famous Chateau de Beaucastel located in Chateauneuf du pape. This property can qualify as one of the Grand Cru’s of the Chateauneuf du pape – if one would make such a selection. Their booth was spacious and really nice, with plenty of natural wood used for decorating. 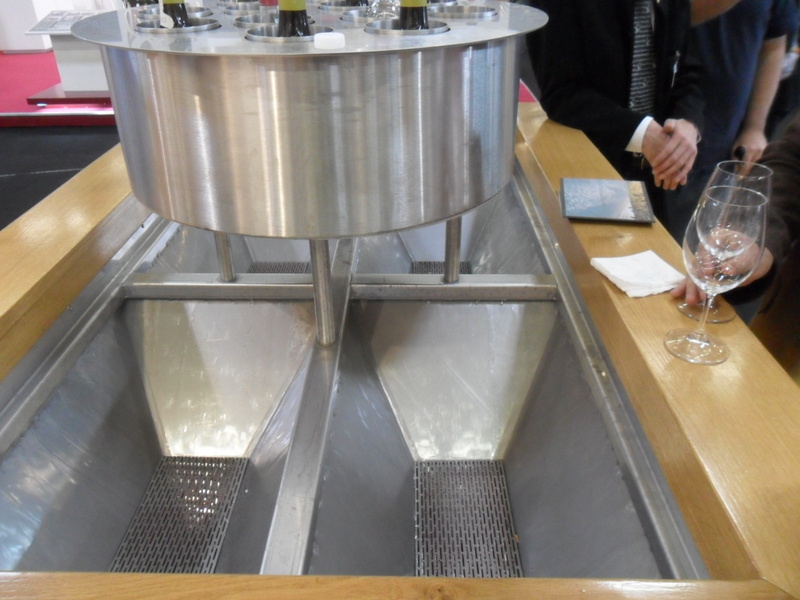 It was the only booth that had an ingenious sink like spitting device that made life easier for everybody and did not need a manual emptying. One of the best looking booths of this fair. The Perrins make also wines labelled as simple Cotes du Rhone. 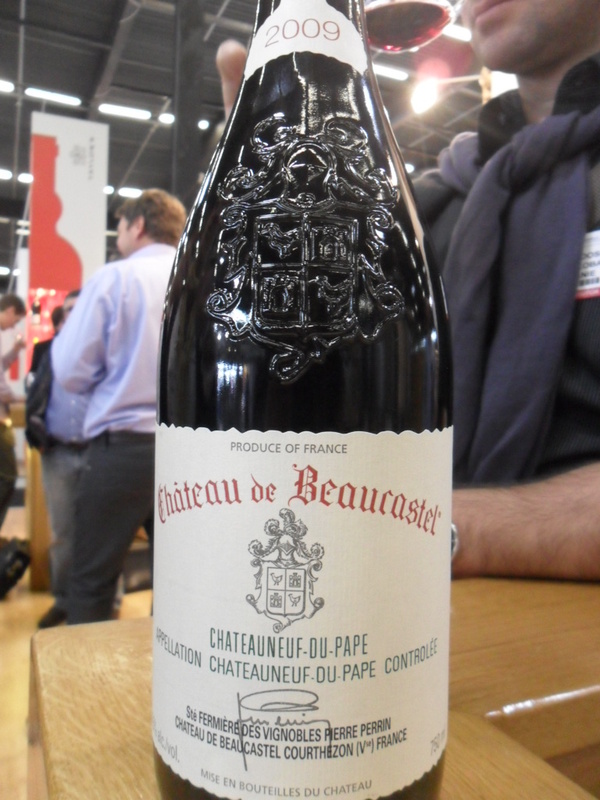 The most interesting and with a great quality/price ratio is the Coudoulet de Beaucastel red and white. Even though the vineyards of Coudoulet are just east of Beaucastel on the other side of the A7 autoroute and the soil is very similar to Beaucastel, the Coudoulet is bottled as a simple Cote du Rhone. The high proportion of Mourvedre insures a good aging potential. 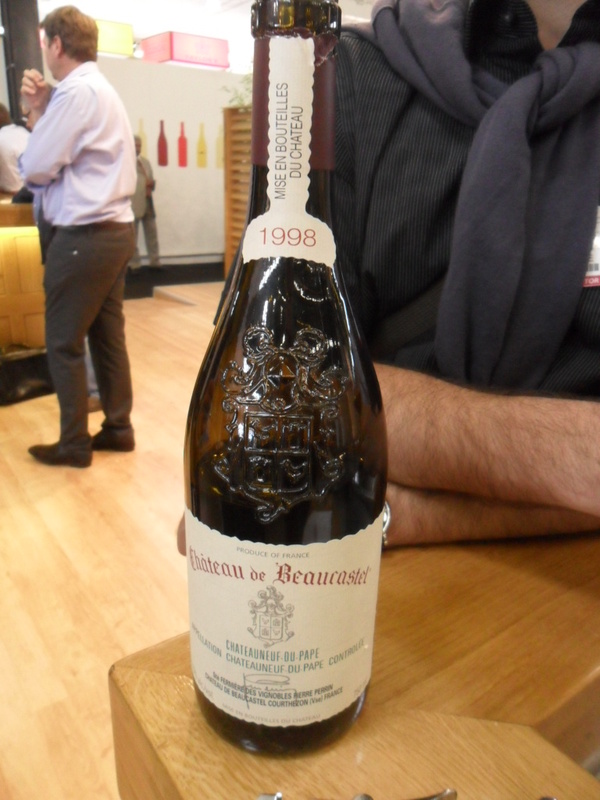 The wines that stood apart during this tasting were the grand vins of Beaucastel. 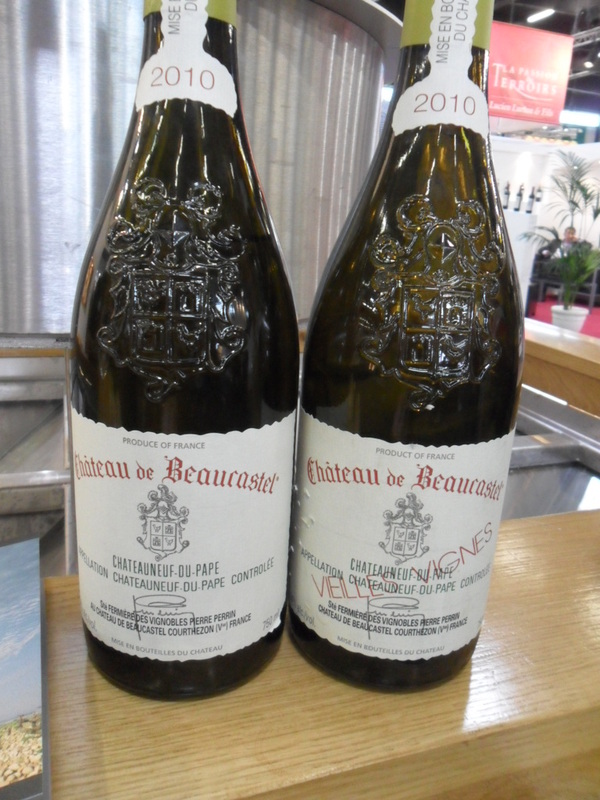 I had the chance to taste three different vintages of red Chateau de Beaucastel and one vintage of whites. 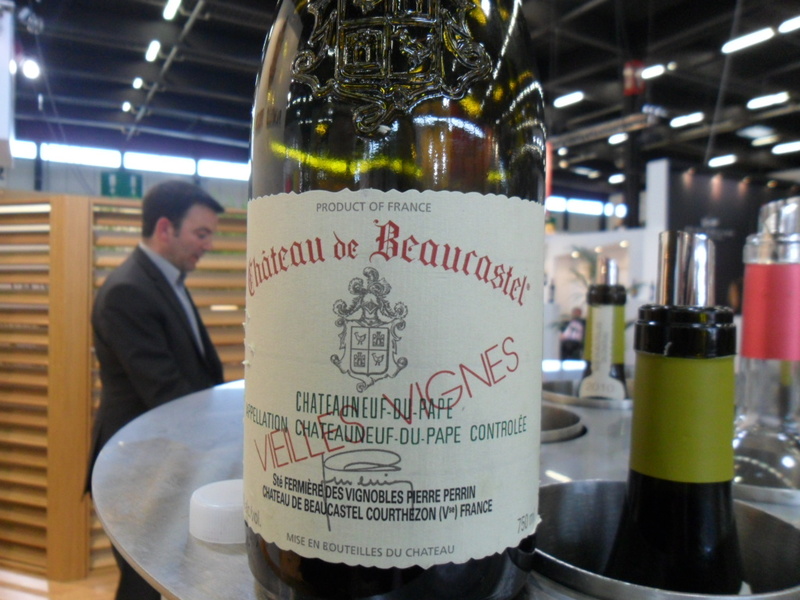 The price of Roussanne Vieilles Vignes is almost double the price of the regular Beaucastel Blanc. After finishing all the new vintages available for public tasting, the lady that guided me through this tasting, generously brought from the back an unexpected bottle of red 1998 Chateau de Beaucastel and offered me a glass. 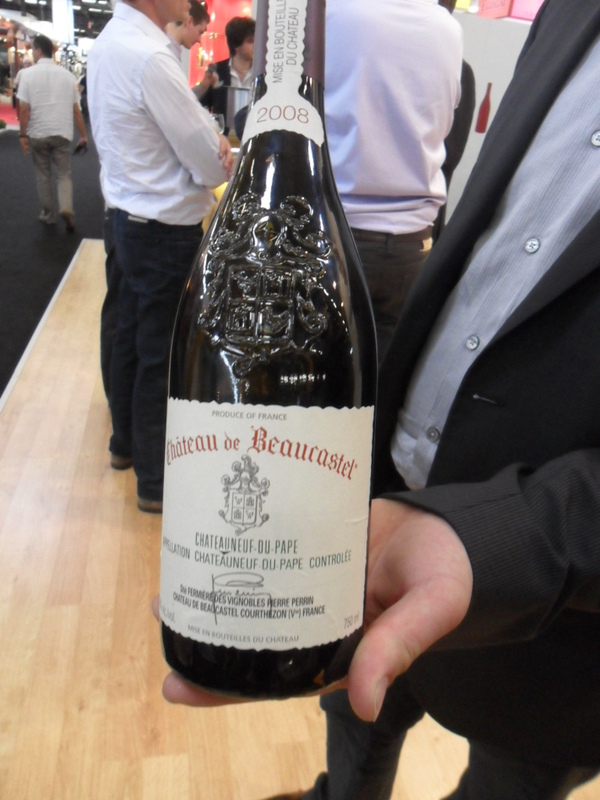 Great way to observe the differences and see how a Beaucastel can age. 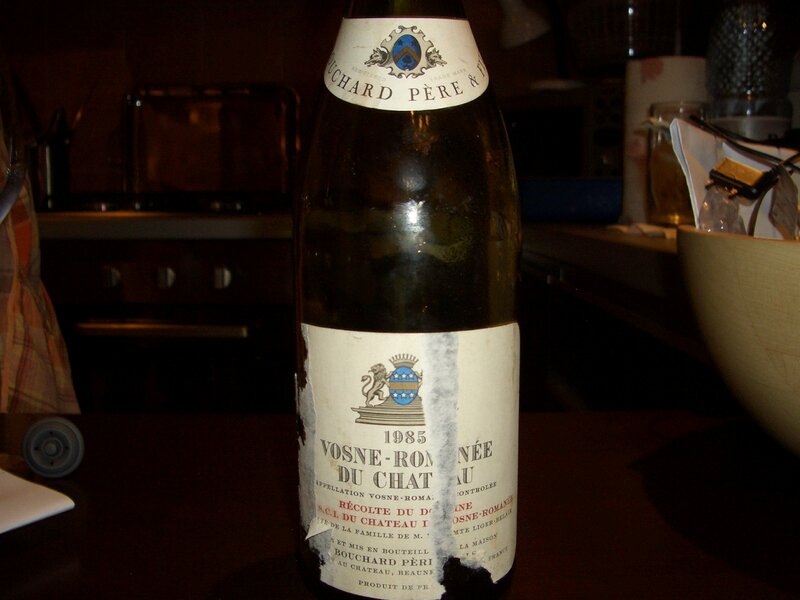 Plus, 1998 was a great vintage in Chateauneuf du pape. Beaucastel’s top cuvee is Hommage a Jacques Perrin, produced only in the best vintages and made mostly from very old Mourvedre vines yielding tiny quantities of intensely ripe and concentrated fruit. It was made in 1989, 1990, 1994, 1995, 1998, 1999, 2000, 2001, 2003, 2004, 2005 and 2007. Don’t ask about the price. Unfortunately I did not taste this cuvee. A good friend invited me to celebrate his birthday. As he is also a wine geek just like me, he organized a really impressive line-up of old wines. As he honestly said it himself, and I totally agree with this statement, the best restaurant is at your place. Especially when you have high quality products and you are passionate about cooking. It was certainly not a vegetarian based meal, but the foie-gras with truffles, the smoked duck breast, the Bellota Iberian ham and the wild rabbit cooked in a vinegar based sauce were truly delicious. The food complimented the wines in a happy manner I would say. 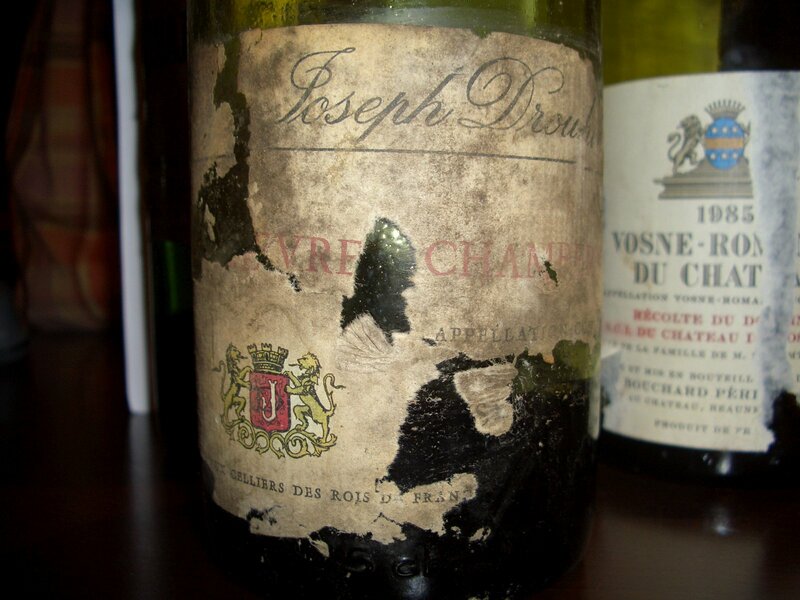 My friend called me yesterday around 5:00pm and told me that he opened a bottle of 1970 Gevrey-Chambertin from Joseph Drouhin in order to let it breathe for a few hours. His first impression was that the wine was dead. I am a fan of Mr François Audouze’s writings and I find very useful his tips on how to prepare a bottle of old wine for drinking. Therefore I advised my friend to Audouze the bottle: put a clean cork back just after uncorking to let the wine aerate very slowly. Not being sure that this method will work and just to be on the safe side, my friend opened another bottle also: a 1969 Chateau Brane Cantenac from Margaux that had a very low fill level. His first impression on this bottle was of a dirty nose of pickled cabbage. Not a good sign either. I advised him to do the same for this bottle: Audouze it, hoping that by the time we meet for dinner at 8:00pm there will be signs of life again. 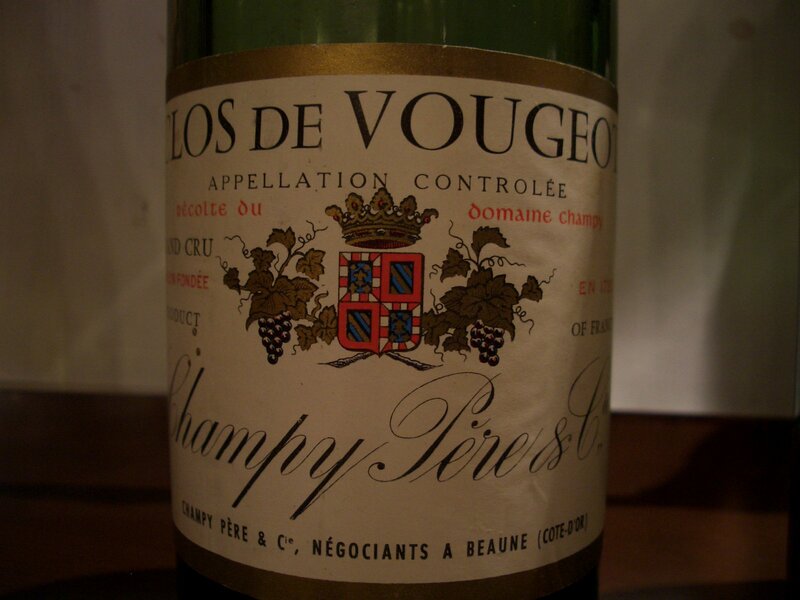 My wife and I arrived around 8:00pm at our friend’s house and to my surprise there were additionally two more bottles of old Burgundies open – I guess you can never be too cautious – that my friend feared to be gone as well: a 1985 Vosne Romanee du Chateau by Bouchard and a 1986 Clos de Vougeot Grand Cru by Champy Pere et Fils. The bottles were recently uncorked and none was decanted. 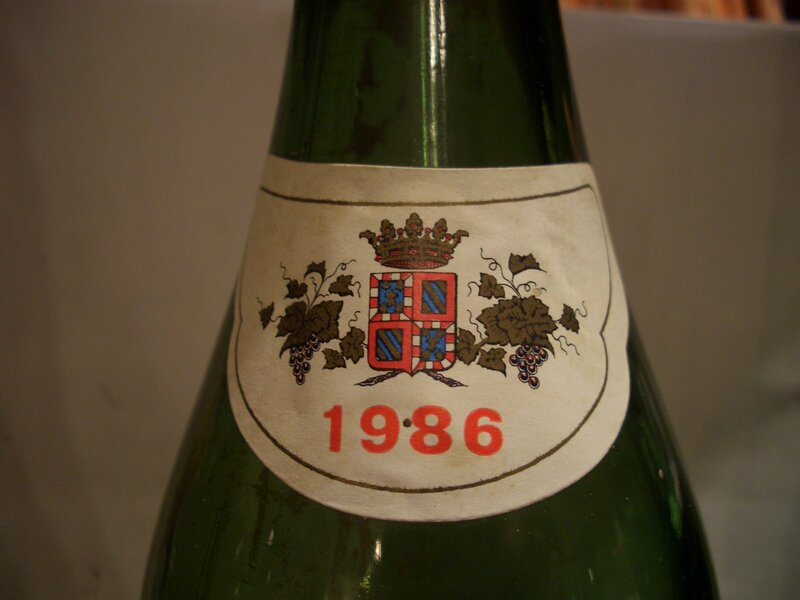 The 1986 seemed initially odd on the nose, while the 1985 had an interesting one. It is important to mention that the fill level for the 1986 was pretty low, but no problems for the perfect fill level on the 1985. We decided to decant the 1985 Bouchard Vosne Romanee du Chateau as, while uncorking, big parts of the cork fell into the bottle. 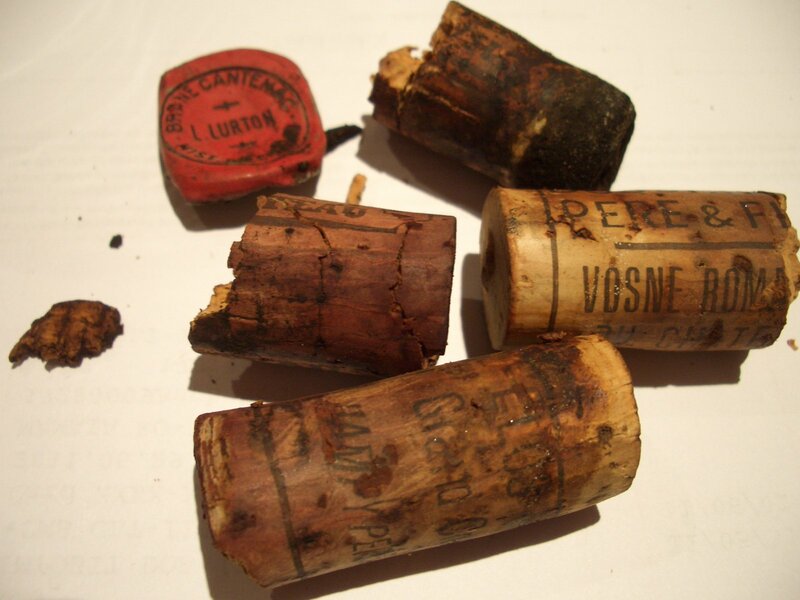 It is important to mention that most of the corks on the bottles did not go out easily and only one went out in one piece. We started the meal with this wine, then put half of the bottle in the fridge and resumed drinking it at the end of the meal. 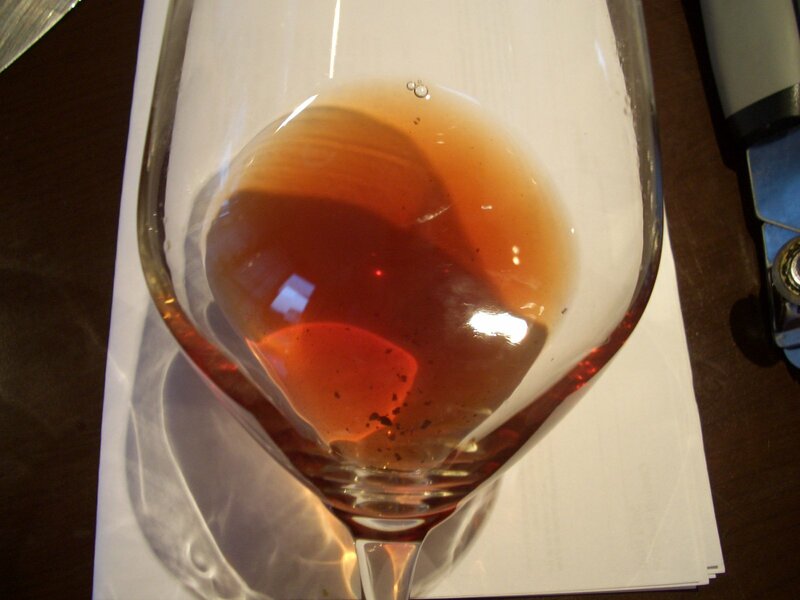 I believe that the 1985 Vosne Romanee du Chateau needed more time to aerate, as it felt there was something more still hidden underneath that waited to be revealed. Unfortunately the bottle was gone too soon. 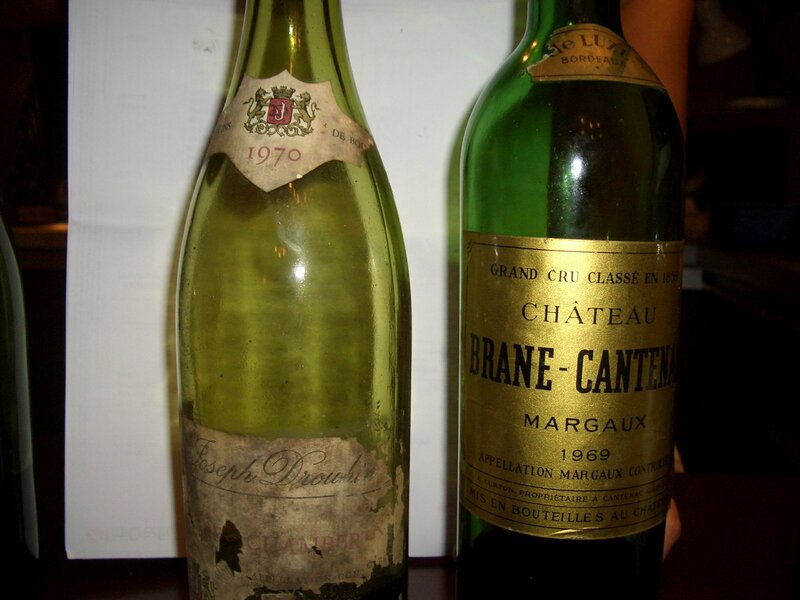 As a conclusion on the wines: the stars of the evening were undoubtedly the 1970 Gevrey-Chambertin and the 1969 Margaux. 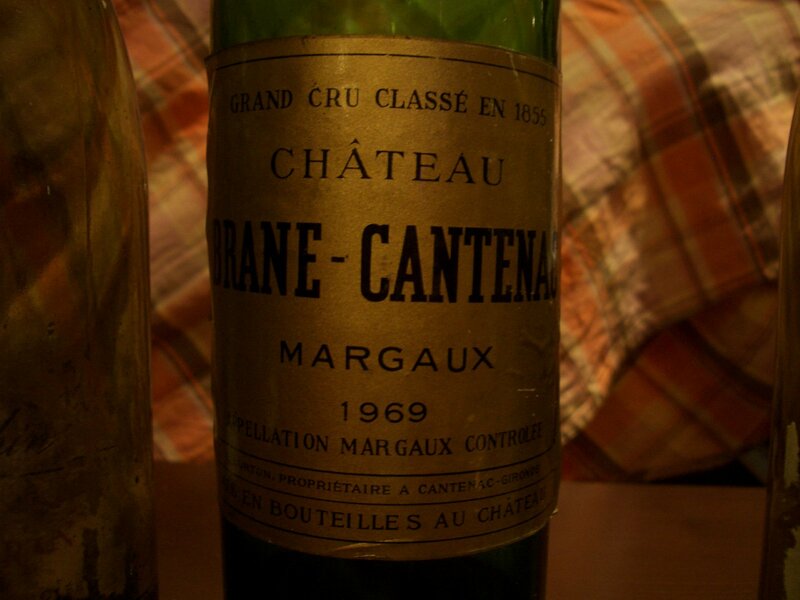 I would place the 1969 Brane Cantenac as the Wine of the Night as I really enjoyed its preserved Cabernet Sauvignon typicality. 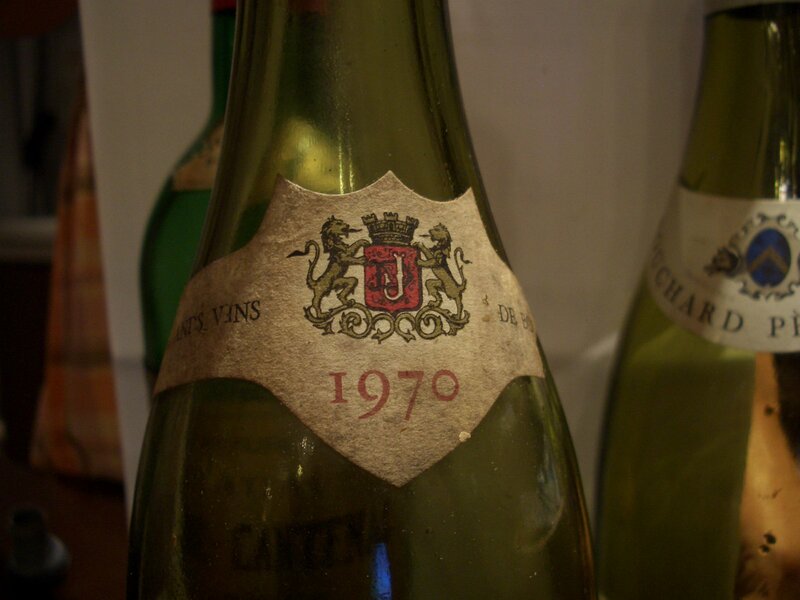 It was a really interesting experience from the old wines point of view – it is important to know how to prepare an old bottle of wine before drinking it -, a very entertaining evening with good friends and a delicious culinary experience. Thanks a lot C. for sharing this wines and Happy Birthday again. 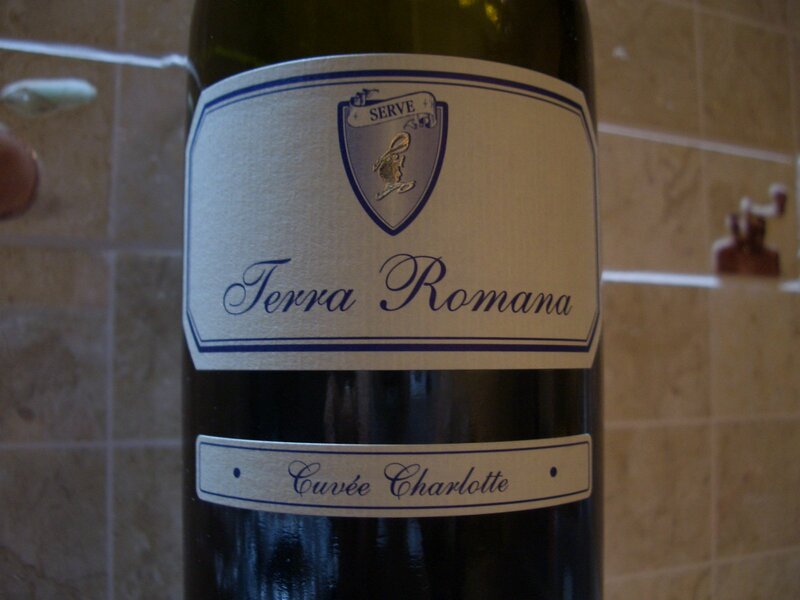 I received this wine from Serve during my December 2010 visit at the winery. Mr Aurel Rotarescu, the winemaker, gladly gave me a tour of the winery and also offered a wide range of wines from bottles and barrels for tasting. 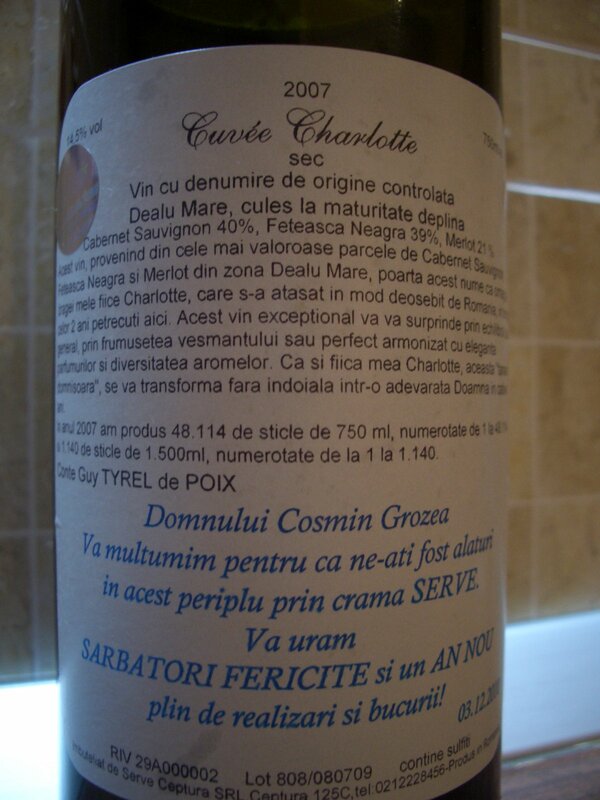 The most interesting wines, as I remember, were the 2007 and 2008 Cuvee Charlotte, and the Cuvee Alexandru 2007. I got to open this bottle about two weeks ago to pair it with grilled beef. While the weather was still very warm, not to say hot(31 Celsius), the wine showed pretty well. It was served a bit colder than the recommended serving temperature. Unfortunately I lost my tasting notes I got when I had the wine, so my notes below are from memory. Last week I had Vali from Vinul.ro at my home as a guest. He came over to take pictures of my cellar and also to make an interview about the investment in wine. We talked about wine as an alternative financial placement, about the criteria of choosing a wine as an investment, about how to structure a wine portfolio and what type of ROI can an investor see from his placement in wine. It is the very first time I am interviewed; so far I was the one asking the questions. I am both thrilled and curious how the final article will be in the September’s edition. As the weather was still hot outside(32-33 Celsius), it seemed a good idea to have some cold sparkling wines. 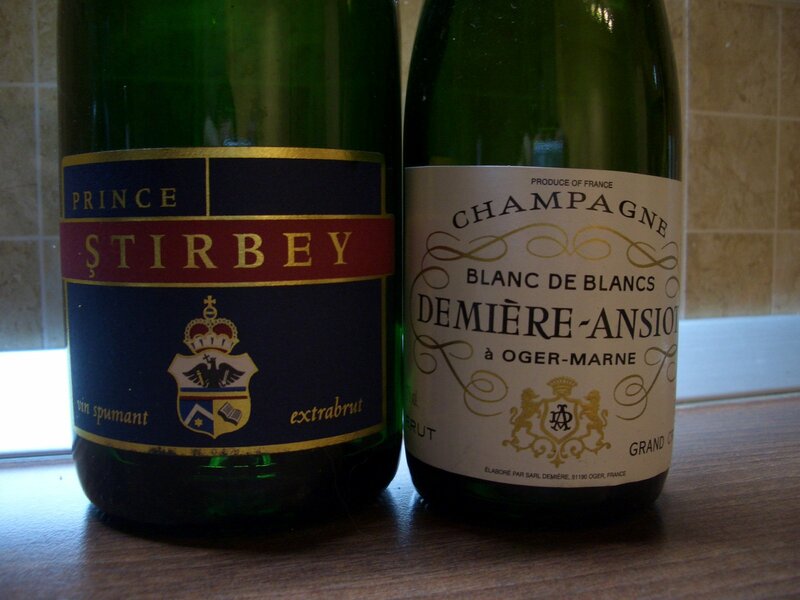 Plus, I long wanted to compare the sparkling from Stirbey(I am a huge fan of this wine) to a genuine Champagne. So this was a good opportunity to do it. As a conclusion on the wines: while there are considerable differences, I still believe that the Stirbey’s sparkling is a really good wine and an affordable competitor to the more expensive Champagne. Stay tuned for the September’s interview.